The Paper Napkin ISSUE 2 Launch Party! 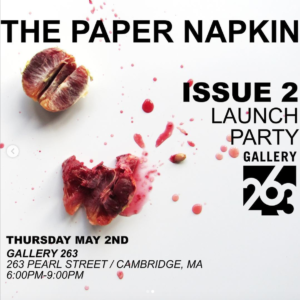 The Paper Napkin is throwing a launch party for ISSUE 2! When? May 2nd from 6-9 PM! Where? Gallery 263 in Cambridge. This will be a free event and open to the community. Come by to pick up your copy of ISSUE 2 and say hello. They can't wait to show you the work of their incredible contributors. The annual Foraged Banquet is one of Gallery 263’s favorite fundraising events. This year, gallery co-founder and expert forager David Craft will partner with returning chef Paul Lang to create a multiple-course menu featuring foraged and locally-sourced ingredients. 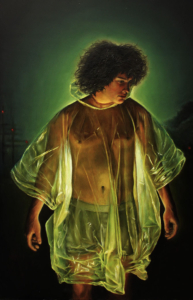 Light vs. Dark—a national exhibition juried by Ruth Erickson, the Mannion Family Curator at the Institute of Contemporary Art in Boston—will be on display during this event for your viewing pleasure. Learn more and purchase tickets here.